oil on canvas, 20 x 36 in., signed l.r. : "Saul Berman"
Saul Berman was born in Russia, spent the most important years of his career in New York City, and came to Los Angeles c. 1944 where he ultimately died. His 1920s paintings might be termed Social Realist as he depicted city folks engaged in average daily activities (such as cleaning the house and riding the subway). During the Depression Berman gained income from government art projects -- producing prints for New York’s WPA (1936) and murals for the Treasury Department in the post offices at Thompsonville, Connecticut (1938) and Ashland, Massachusetts (1941). 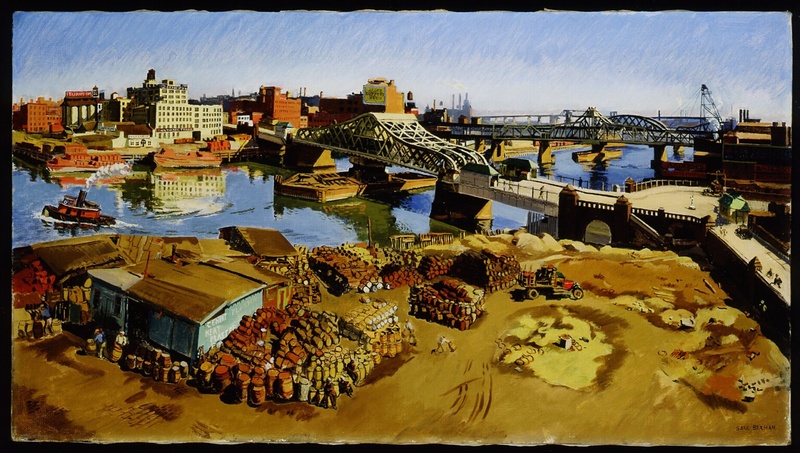 At the same time he created a number of “American Scene” easel paintings, usually taking the format, as in Harlem River, of an expansive cityscape in which small people are at work. The Harlem River cuts across the northern end of Manhattan linking the East River to the Hudson. This view, taken not far from the junction of the Harlem with the East River, looks west. Behind the foreground Willis Avenue Bridge (finished 1901) is the Third Avenue Bridge (opened 1898), and others. The Willis bridge is a swing span bridge, meaning it pivots on the artificial island below it to allow large ships to pass. (It was to be replaced in 2009 with a newer bridge.) American Scene celebrated the average man (as opposed to earlier styles, such as Impressionism, that often depicted the well-to-do) and often showed him in physical work. Industrial sites, work-worn trucks and other vehicles (including the energetic tugboat seen here), decrepit buildings, and unpicturesque things like mud holes, were things to be emphasized not eliminated. While many 1930s artists adopted the simplified, bulky style of Mexican artists such as Diego Rivera, Berman retains detail, and some of his elements seem toy-like, almost like the animated films that were then rising to artistic prominence in Hollywood. His coloration may adhere to the decade’s taste for blacks and browns, but overall it escapes being depressing (the goal of some of Berman’s peers) thanks to Berman’s use of dramatic light and shadow and the crystal clarity. In Los Angeles, Berman held a show of his work at Stendahl Galleries (1944) and painted several scenes of the state including Wilshire Boulevard, Los Angeles (Collection Trust Company of the West), Eighth and Vermont, and Southern California Expansion (both sold Butterfield, 12/09/1999, lot 5478 and lot 5479 respectively) showing freeway construction.